Going into Rogue One my only thoughts on the character of Draven had to do with the since-debunked speculation that he was really Agent Kallus from Star Wars Rebels. After walking out of the film, however, I found that I was fixated upon the Alliance general. Many fans I have talked to say that they disliked the character, or that while they understood his purpose and saw him as a necessary irredeemable jerk they still did not have much love for him. I was honestly surprised by this reaction because for me he was incredibly interesting and I wanted to see more of him as soon as possible. Throughout Rogue One we see a lot of shades of grey within the Alliance. Jyn, Saw, Cassian, and Draven are the biggest examples of this. Within each of those two duos is one protégé and one old warrior who has given everything to this war dating as far back as the Clone Wars. Saw and Draven are incredibly fascinating to compare to one another. Each man is an embodiment of the shades of grey within the Rebellion, and yet they are vastly different people. Saw was hardened due to being a ground-level revolutionary. He lost his sister Steela early on and has sworn to do whatever it takes to win. As he explained to Jyn in Rebel Rising, “Steela was the best part of me”. When Saw’s new war against the Empire began, “I was smarter that time. I didn’t make the same mistakes I had when Steela was still alive.” Saw never got to stop fighting. He never stopped being the revolutionary with nothing to lose, and that shaped him into a brutal, violent soldier who would do whatever it takes even if he had to be a monster. Saw lost his sister, his soul, and has to force away his daughter to protect her. Draven is a reflection of Saw, but rather than being a boots-on-the-ground type, he is the grey within the Alliance command structure. Draven is essentially a sign of what Cassian would be like a few decades from now; a hollowed-out man trying desperately to justify doing anything that can be done to win. Draven served with Republic intelligence during the Clone Wars, he put himself on the line and likely spilled a lot of people’s blood because he was fighting for what he saw as a righteous cause. And yet, in the end, Draven’s own side ended up becoming his enemy; former comrades became collaborators. Draven has spent decades as a spy; that alone would make someone very isolated. Imagine, then, what a massive betrayal would do to a person like that. The only thing someone like him could trust would be his state, the state he was doing everything to protect, and it stabbed him in the back. Just like Saw, Draven would have felt like the war had not ended, but rather shifted. I think it’s time to address the elephant in the room—Draven’s assassination order. Yeah, it was a really bad call morally and strategically, no argument here. However I am not concerned with debating how accountable Draven is; instead, I want to put emphasis on something that tends to be overlooked. You have a former Republic science officer who defected and then seemingly decided to go back to the Empire. Remember the Alliance has no real clue at first that Galen was working under duress. Rebel Rising shows that as far as Rebel Intel (which Draven is heavily involved in) knows, Galen is willingly staying with the Empire. To Draven, this is another former Republic officer like him, but this guy decided to side with the monster their Republic had become. I assume part of Draven deciding that Galen had to be assassinated had to do with him personally seeing Imperial conspirators as being traitors and not worth giving the benefit of the doubt. Now yes, that is closed minded, but again Draven is a spy who has been given reminder after reminder for the past twenty years that Republic personnel now with the Empire have no moral backbone. That does not excuse Draven’s orders, but I feel it does cast them in a different light. Draven is not just another example of moral degradation within the Rebellion; he is very specifically a look at what Cassian could become. Draven has taken his protégé and turned him into a cold, loyal, machine who will do whatever it takes to win, even if doing so is not only immoral but counterproductive. As I said before, killing Galen is tactically idiotic. Draven is making hate-filled decisions, and he is doing so under the guise of cold logic. I doubt Draven thinks that he is calling for Galen’s execution out of hate, he likely saw it as perfectly logical tactic totally bereft of bias. The line between “necessary evil” and outright evil can be so easily blurred that someone can cross it without realizing it. Draven has clearly crossed that line already, and Cassian seems to be approaching it when the film starts. Draven is inadvertently driving Cassian towards becoming the same as him. Both of our primary personifications of the grey side of the Rebellion end up partly corrupting their protégés among RO’s main cast. 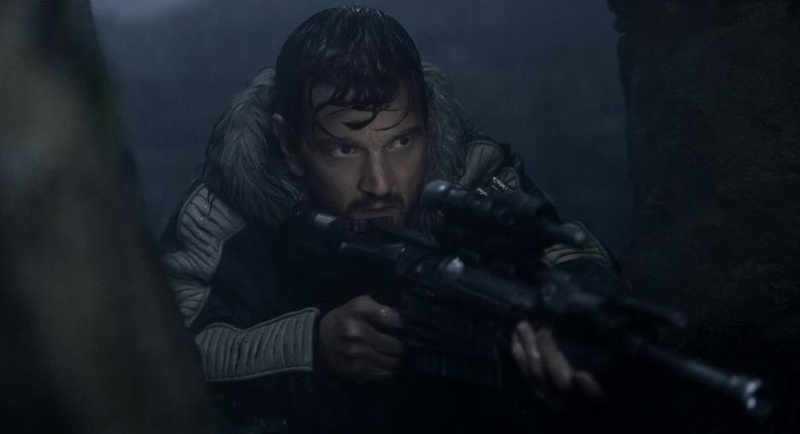 Saw caused Jyn to become apathetic, and Draven almost made Cassian murder someone pointlessly (I maintain that the Galen hit would have been the step too far for Cassian; killing Tivik was grey but arguably not excessive). At the end of the day Saw dies, and Cassian and Jyn choose to overcome their personal prisons by going to Scarif. By the credits of Rogue One, many shades of grey in the Alliance have been cast aside. However, Draven is still up and kicking. I have seen fans lament that Draven was not kicked out of the Alliance or demoted. However I feel like Draven still being around, and important, is a fantastic vehicle for further exploring the themes of Rogue One. In issue #35 of the main Star Wars comic, we see him working with Han to get information out of Grakkus the Hutt. 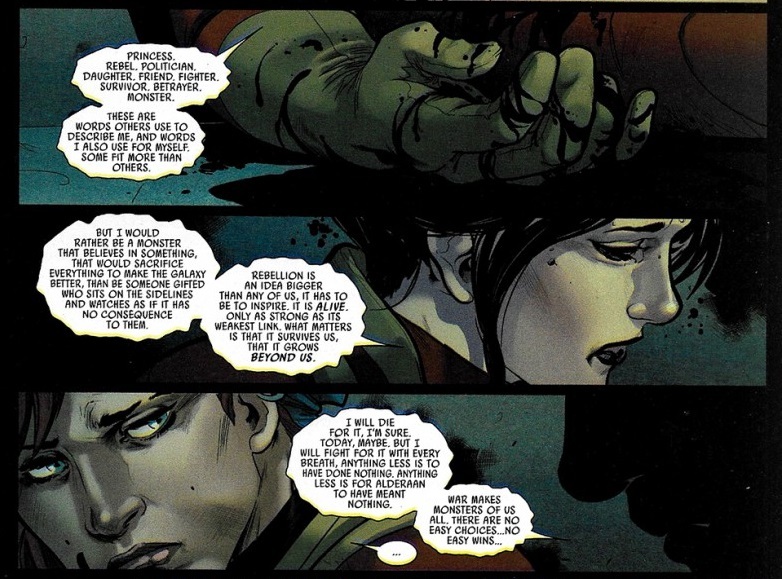 By the end of the issue, we find that Han planned a clever trick to get Grakkus to give over the intel and that Draven went along with it, letting Han take the lead. That’s a small little moment but it tells me something important: Draven can change. Saw was never able to change; he kept fighting until the end, until he was out of chances. Jyn and Cassian died heroically on Scarif. Draven is our last element of moral ambiguity from Rogue One. Showing that Draven can overcome his flaws—trusting a smuggler to carry out a mission on his own in a non-violent manner—really shows that redemption does not have to come from heroic sacrifice. The fact of the matter is that the Alliance will always have a grey element to it, and that’s fine. The events of Rogue One don’t come close to washing away the blood on their hands, nor should they. Case in point: Leia’s wonderful speech from Star Wars Annual #2. The Alliance will make tough choices again and again, and sometimes those choices will involve innocent blood being spilt, intentionally or otherwise. The Rebellion after the events of Rogue One is not some pure, infallible organization, but they have been through a sobering moment. Draven lost Cassian, whom he clearly did give a damn about. Keep in mind that Cassian was once a Separatist, and yet Draven had taken him under his wing. What I am getting at is that Draven is not just an embodiment of the greyness within the Alliance, but more importantly, a sign that they can acknowledge that greyness—even act on it sometimes—and still rise above it at the end of the day. The Alliance at the end of the Battle of Scarif is still imperfect, but they can get better. Draven is a symbol that we can escape our prisons, even the ones we carry around with us. A bitter, pessimistic spy could escape his prison when given hope, and what was it Draven’s late protégé said about hope again?